hitting the web running: boxee is my hero! I feel like almost every cool 2.0 web application I've learned about has been introduced to me by my brother-in-law, Jonas. You could say he has his finger on the pulse. So, when flickr first started up, he was there. Being trigger happy with the camera, there were almost constant update emails about new photos he had uploaded. And it was sweet. Suddenly from, no matter what distance I was, and am still able to, keep up to date on what my sister and her family were up to. And, to break it down to its simplest form, it really is great to be able to keep that closely in touch and be able to see each other even though we may not be able to travel the distance to visit face to face. To be honest, I think that's part what I appreciate most about the 2.0 advancements. 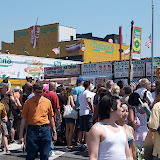 and view my outing to the Mermaid Parade at Coney Island last year before its great demise. There is some serious eye candy. Anyways, as my title suggests, neither Flickr nor picasa are the hero of this story. Allow me to introduce you to my newest online buddypal: Boxee. Check out the awesome video about all that Boxee can do. And don't be fooled by the super cute logo. Boxee is some serious business. With a little fiddling, Boxee has been able to pull all of my online and local media into one location. Now I don't have to open 15 websites to catch up on my TV shows. Now I don't have to search my entire computer to find where I saved that song I want to listen to. Now I have Boxee. Boxee is my ever faithful computer puppy. I love you Boxee. I, too, have a friend who seems to always be ahead of the curve on these kinds of things. He's a web designer, though, so I feel like he has the upper hand. He works with the kinds of folks who design/create these things... so he's expected to know it all, I guess.